A Girl and Her Scout: Artist Highlight and GIVEAWAY of the week!! Artist Highlight and GIVEAWAY of the week!! Meet Bonnie of Bonnybee Designs. I met her at the Knoxville Arts and Crafts Fair. She is a FABULOUS jewelry maker and makes some really awesome beaded hairbands (like the one pictured above- perfect for daily wear or for a bride I think!) as well as some beautiful, high quality, and stylish necklaces, rings, and earrings!! She has most graciously not only offered to participate in an interview on A Girl and Her Scout, but also host a GIVEAWAY and a DISCOUNT in her store for my readers so check out the interview and how to enter the giveaway below. Hey Bonnie! Welcome! Tell us a little bit about yourself and your art. Well, I’m a 22-year-old East Tennessee girl who is the designer and artist behind Bonnybee Designs. I create affordable, unique and stylish jewelry and accessories. Besides the beautiful jewelry and headbands you have in your Etsy store, what else do you like to do? I have always loved all types of crafts. I learned at a young age how to sew from my grandmother and have made clothes, purses and costumes. I have my very own pottery wheel and kiln and love to make pottery. Woodworking – building, repairing and repurposing furniture - is also something I enjoy. In addition, I love making mosaics and any other project or craft that comes my way. I also have a life outside of crafts which includes a passion for social justice work (I have a degree in Economics and am pursuing a career in Public Health Policy), hanging out with wonderful friends, playing with my dog Wrigley, playing sports and enjoying the outdoors, reading, and traveling. What first drew you to arts and crafts, especially jewelry making and beading? Growing up I was not very good at visual arts like painting or drawing, but I was hooked on little kid crafts like macaroni picture frames, fusible bead Christmas ornaments and lanyard keychains. I collected any type of resource available and learned how to make friendship bracelets, hemp necklaces and plastic beaded jewelry. As I grew older and my taste matured, I used my skills and interest to create stylish pieces of jewelry that I wanted to wear. I like to learn many different techniques and acquire various materials, then see what I can combine them to make. I go through life with my eyes open, ready to pick up a new idea or project. Other artists, traveling to various countries, and working with new mediums, inspire me. I constantly scribble notes and sketches in a notebook I carry around in my purse. What advice would you give to aspiring artists and Etsy shop owners? Make something that is uniquely you and expresses your vision. For me having a shop on Etsy is not about making money, but more about supporting my passion. My favorite and most inspiring artists are ones that do something unique and wonderful, not necessarily the ones with the best prices. Handmade goods are all about the vision that goes into making them and the statement it makes to wear something that was produced this way. Finding out what my vision is, and what I can create is something I am constantly discovering. I am excited to do this for the rest of my life. Thank you so much for sharing your creative juices! to the chosen winner (chosen via a random assorter) on Thursday, August 26th at midnight so be sure to get in your entries by then! To enter, head over to Bonnie’s Etsy Store, Bonnybee Designs (by clicking here), and leave a comment here about your favorite item(s). 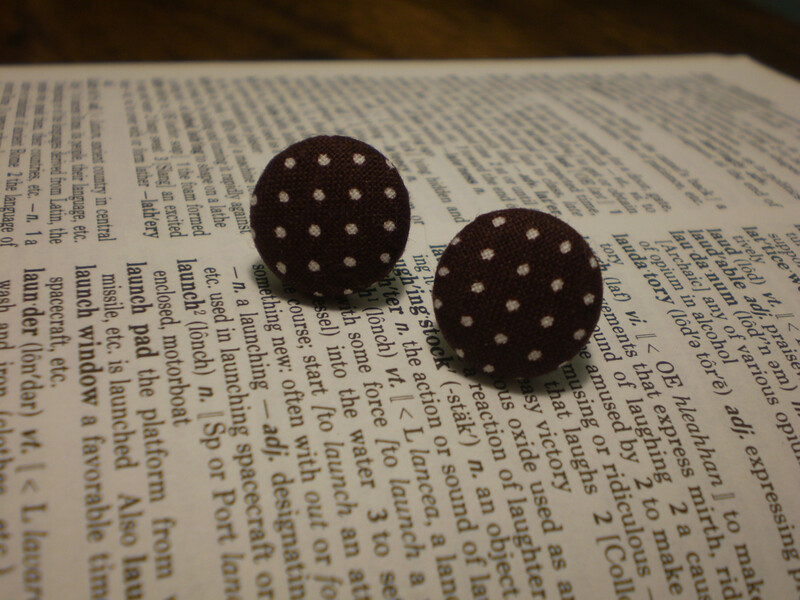 Additional entries for: 1) becoming a first time follower of A Girl and Her Scout 2) Posting this giveaway with a link to my blog on your blog 3) Posting this giveaway with a link to my blog on your facebook and/or twitter 4) “Hearting” or adding Bonnybee Designs to your “Favorites” on Etsy and/or 5) making a purchase out of Bonnie’s store (one entry for every purchase). Be sure to leave a new comment for each additional entry! In addition, through September 15th Bonnie will be offering a 15% discount to all A Girl and Her Scout readers! YAY!!! Just use key word “blogger" (you probably want to add “in a message to buyer” here) at check out to receive your discount. Happy shopping and crafting and many thanks again to Bonnie for participating in my Artist Highlight of the week! I am so lucky to be the first one to comment on these lovely ear rings! Wow,Bonnie is so talented and she has many lovely things in her ETSY store. Ohhhh jewelry!! :) Thanks for the post! I like earrings too. This is an exciting adventure in art. Thanks for posting this Allison! I am always looking for new artists on Etsy, and it is always great to get recommendations! 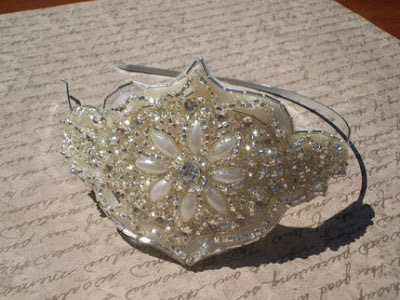 I really liked the the White Leaves Headband, very classy but simple! I might have to take advantage of that discount! And followed the new incarnation of your blog! I'm looking forward to seeing the direction it takes. Cute, cute, cute! I love searching around on Etsy and frequently try and feature artists on my blog too; but Bonnie's stuff is new to me! Thanks for sharing - hope this helps to bring some customers her way!